As a wildlife photographer, the one question I am asked more than any other is, ‘Which is your favourite image from all the photographs you have taken throughout your career?’ It’s a question that is almost impossible to answer, as there are so many that I return to time and again. However, this image of an arctic wolf is one that never fails to make me smile, and it is perhaps my favourite image from my career. This photograph was taken in around 1986 on Ellesmere Island, which is part of the Qikiqtaaluk Region of the Canadian territory of Nunavut. What’s interesting about this shot is that I was actually in the area shooting a North Pole expedition and following a dog team on assignment for National Geographic. It was a people story and this was one of several incidental images that I took. Just a few days into the assignment I spotted a pack of wolves. Little did I know then that I would end up spending around three years getting to know them and seeing them grow up. I particularly got to know the wolf that you see here. He was the alpha male of the pack and this image is representative of his dominance. I was standing on the frozen ocean when I took this picture and, if I recall correctly, he was looking down at some of his companions. The light is particularly striking in this image. Ellesmere Island had just come out of a prolonged period of darkness that had lasted several weeks, and the sun was just starting to come up. A week or two before this, the sun would just peep over the horizon for little more than a minute and then disappear again. The next day it would be there for two minutes and the next day a little longer. After a few days it would reappear as normal. 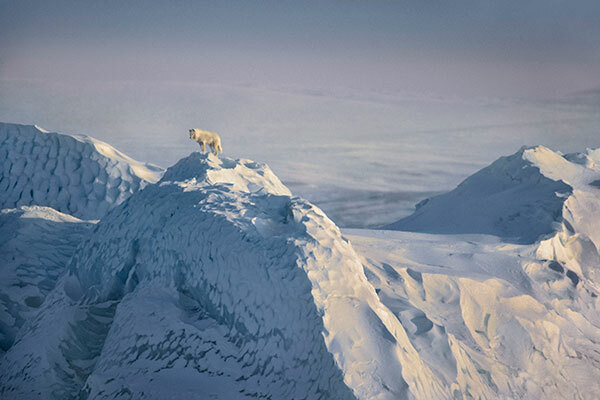 The wolf seems to be standing on the edge of the iceberg watching the light reclaim the land. The light really interacts with the graphic shapes of the ice beautifully. It helps to give a three-dimensional sense of scale, particularly when you compare it to the out-of-focus background. Often, when I’m on assignment, I find that I take my best shots on my way to and on my way back from a venue. I’ve learned to take a wider view and not be too focused on the task at hand, otherwise I may miss something. I actually got into a bit of trouble with National Geographic as a result of this. When I sent my film to the magazine, they saw that I was shooting these wolves. The magazine had actually sent over another photographer to shoot the wolves at the same time. They told me that I wasn’t supposed to be shooting the wolves, so I had to really argue the case and tell them that I was onto an epic story. It was only when I sent them the shot of the leaping wolf (AP 5 May 2012) that they saw I had captured something quite special. It was then that I learned to trust my instincts and follow my heart. I knew the wolf story was something that I had to pursue, even if it meant me risking my career. This particular image set the mood for the entire project that followed, and more than that, set the tone for my entire career. It opened up my eyes to a way of life that still carries me along today. However, National Geographic didn’t actually publish this image. In fact, it hasn’t been published much at all. For me, the image seems to grow. It gets stronger in my mind as the years pass. When I shot it, I didn’t really look at it that much. It didn’t even appear in my book White Wolf, which contains 144 images. The image is perhaps a little more dignified than many wildlife shots you see. It speaks of the land, and I think it works in much the same way as the image of the oryx that I talked about in my last Photo Insight (AP 2 March). Much in the same way that you listen to a particular musician or band and hear a particular style, I hope that people can see a photograph like this and realise that it’s one of mine. The pictures of the wolf and the oryx were taken at opposite ends of the earth, yet both speak of the grand landscape. With the addition of the animal subject, the picture becomes a statement about how I like to shoot. You don’t need to get close to an animal, although I have taken close-up shots in the past. I grew up in an era when every photographer wanted to produce frame-filling portraits. They were trophy shots in a sense, as everyone wanted to see how close they could get to deer and birds. However, this image has breathing space. It was shot on Kodachrome film and would probably have been captured with a 300mm or a 70-200mm lens. I judge a lot of wildlife competitions, and when I look at this image it raises a few issues. I examine a lot of work, and sometimes I look at a handful of the images that have been entered into competitions and have to figure out whether they have been manipulated in post-production. In the past, I’ve had to discount images from competitions because I’ve discovered that they have been heavily manipulated. If I saw this image of the arctic wolf entered into a competition, I would certainly question its veracity. It’s such an unlikely shot, but that’s why it’s one of my favourite images. This was one of those moments that photographers dream of, as it delivers a subject at the perfect place at the perfect time. It’s rare that you get to talk about a shot that works perfectly.